The ensemble of the chateaux and parks of Potsdam is an exceptional artistic achievement whose eclectic and evolutionary features reinforce its uniqueness: from Knobelsdorff to Schinkel and from Eyserbeck to Lenné, a series of architectural and landscaping masterpieces were built within a single space, illustrating opposing and reputedly irreconcilable styles without detracting from the harmony of a general composition, designed progressively over time. Potsdam, mentioned first in the 10th century, acquired some importance when the Great Elector of Brandenburg, Frederick William (1620-88) established his residence there. Potsdam housed a small garrison from 1640 onwards; the site’s military function was strengthened by the young Prussian monarchy. Under Frederick II the Great (1712-86) Potsdam was radically changed. The new king wished to establish next to the garrison town and settlement colony of the ‘Sergeant King’ a ‘Prussian Versailles’, which was to be his main residence. In 1744 Frederick II ordered a vineyard to be planted on six terraces on the southern side of a hill, Bald Mountain. Sanssouci, a name which reflects the king’s desire for intimacy and simplicity, translates the theme of a rustic villa into the marble, mirrors, and gold of a Rococo-style palace. 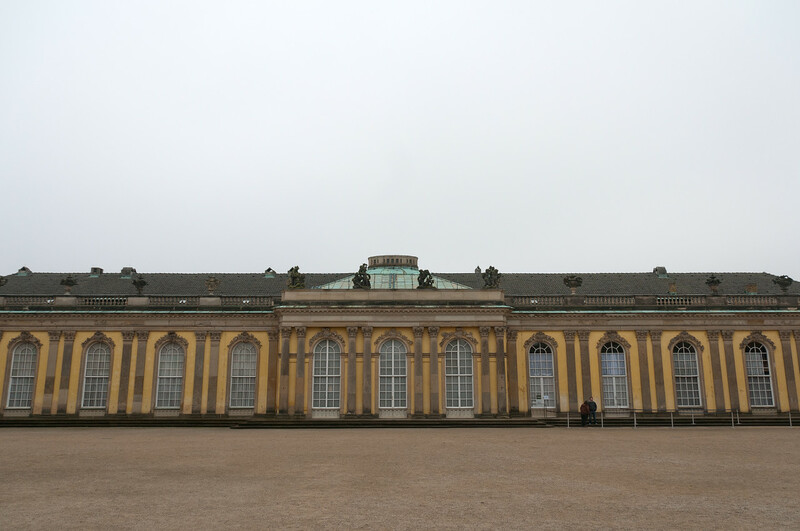 One of the things which surprised me about Berlin was the number and quality of the palaces in the area, especially in Potsdam. Many of the palaces in the area surrounding Berlin did not receive heavy damage during the war. The highlight of the world heritage site, in my opinion, was Sanssouci, the palace of Frederick The Great. 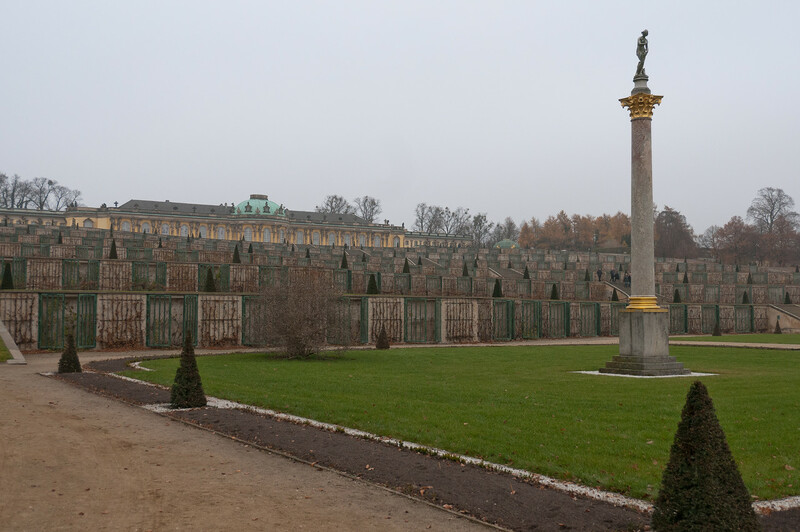 One of his final requests was that he be laid to rest on the grounds of Sanssouci with his favorite greyhounds. In 1991, 205 years after his death and after the reunification of Germany, his request was finally granted. 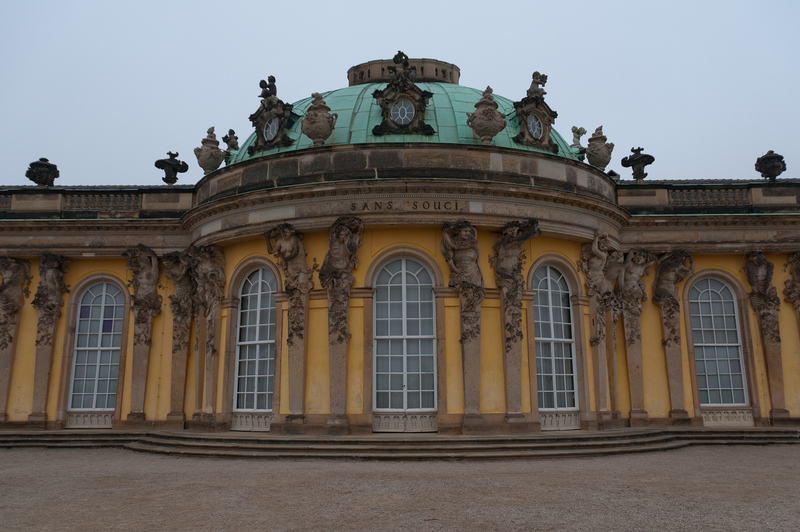 Sanssouci is about a 15-20 minute walk from the Potsdam train station. I’d recommend visiting in the summer as in the winter, all of the statues in the garden were covered and the fountains were drained when I visited in the winter. The Palaces and Parks of Potsdam and Berlin is a cultural site recognized by UNESCO among the World Heritage Sites in Germany. It was inscribed in 1990 and extended in 1992, and then again in 1999. This world heritage site consists of a group of palaces and parks, along with extended landscaped gardens within the Havelland region of Germany (to which Potsdam and Berlin are a part of). The site was recognized by UNESCO for its historic unity of landscape. Furthermore, it is believed to be the perfect example of a unique landscape design featuring monarchic ideas of the Prussian state. 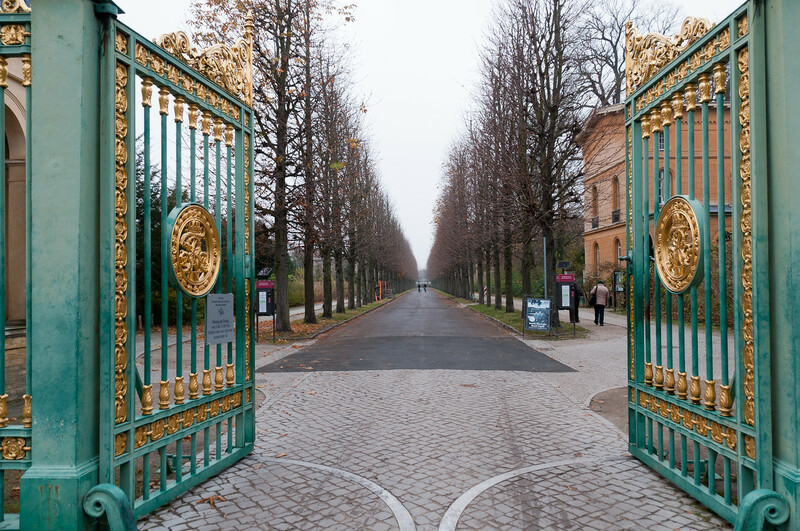 The Palaces and Parks of Potsdam and Berlin are of outstanding cultural treasure in Germany. The expansive parks, elaborately designed buildings (over 150 of them), and the majestic tree-lined avenues combine to make this one of Potsdam’s and Berlin’s most important architectural monuments. It all started when Frederick the Great commissioned for the Sansoucci Palace to be built in 1745. He wanted the palace to become his summer residence. Hence, it also makes the Sansoucci Palace as the oldest structure within the group of parks and palaces recognized by UNESCO in this property. The entire property that was added to the UNESCO list covers more than 2,000 hectares in land area. These palaces and parks exhibit not just a harmonious and unified architectural movement, but also an architectural heritage that makes them unique in Germany. For this reason, some of the sites included within the UNESCO site have been drawing tourists from all over the world. It has also captured the attention of filmmakers as some of these sites have been picked as film locations. Really beautiful and sad that I have not once visited these said palaces even though I have been to Berlin on at least 5 different occasions. Oh nice one this place have so internal beauty of many parks where many fountains do their work and really this is nice place to watch. Yes, everywhere you look, the buildings were beautiful and well preserved. Very impressive. Great shot Gary!